Light displays, the Downtown Holiday Parade, and the “Jolly” Trolley on South Main are good reasons to go downtown the day after Thanksgiving. 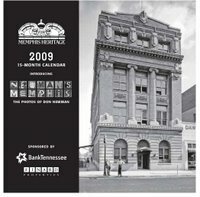 And the 2009 Memphis Heritage calendar is a great stocking stuffer for Memphis lovers. Bands, performers, local celebrities, and dancers marching north on Main Street from St. Paul to Huling. Before the parade, there’ll be family activities in the shops and galleries along South Main – everything from face painting to magic shows - as part of the FM100 and WRVR 104.5 /The River Make-A-Wish fundraiser. 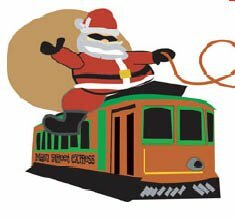 And after the parade, there’s the South Main “Jolly” Trolley Night, December's on-the-street festival, with music, entertainment, and egg-nog in the shops and galleries. The 2009 Memphis Heritage calendar focuses on our historic downtown. Photographs by Don Newman have been selected by Bank Tennessee and Finard Properties to celebrate the opening of a Bank Tennessee branch at the corner of Court and Second in what was originally the 1907 Commercial Appeal Building. The building was converted to house Welcome Wagon in 1923. For more information about Memphis Heritage’s calendar party and how to buy a copy of the calendar, click here or phone 901.272.2727.